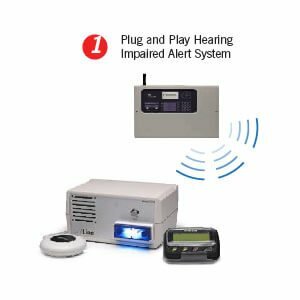 LifeLine is the perfect solution for alerting the deaf and hearing impaired to a fire alarm. It can be used in all applications including commercial and office buildings, education, hotels, guest houses, care & residential accommodation. LifeLine helps you meet the needs of the Equality Act. Once LifeLine has been wired, via relay, into an existing fire panel or system and the antenna coverage set, the system will alert users to fire alarm conditions via pagers, or a bedside unit and vibrating pillow device. LifeLine will not interfere with other radio systems and requires no complicated and expensive contracts or service agreements to be in place.